Last year, I wrote a post singing the praises of vintage and new aprons which were worn by home cooks–our Grandmas, Moms, Aunts and which were at one time ubiquitous in the American kitchen. The apron revival I wrote about then is still going strong, and there are more and more people making new aprons that look old, and new aprons that look contemporary and new aprons made from old fabric, and so on, so forth and on and on. National Tie One On Day was celebrated for the third year in a row a week ago today, on Thanksgiving, and local independent fabric stores and quilt shops participated in the event by holding apron “sew-ins” where sewers and quilters gathered to make aprons to donate to women’s shelters and other charitable organizations. 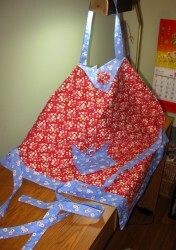 And, this year, I finally got off my duff and started making aprons myself. 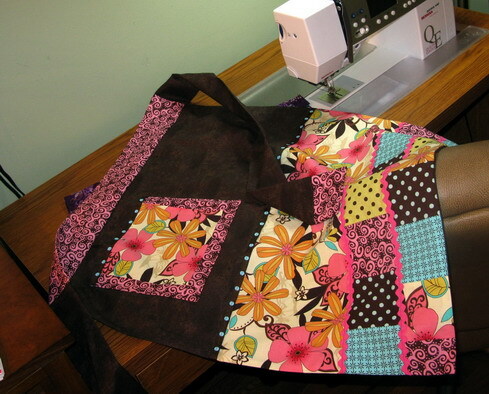 I am making a whole passel of them as gifts for friends and co-workers (none of whom read this blog–except you, Hilarie–and you I can trust to keep mum about my plans), with each apron’s fabric, trim, design and colors chosen to reflect the personality of the recipient. I am very proud of the results–I have most of them finished at this point, and wanted to share pictures of them with you all here today. Most of these aprons were made without patterns, and all but two of them are lined. The first apron pictured here was made by piecing asymmetrical strips of fabric into long rectangles, and then cutting the two halves of the apron skirt out of those rectangles. I lined the skirt with the same fabric that I used for the waistband and pocket, and then made soft pleats in the skirt before sewing it to the waistband in order to create fullness and swing in the skirt, since the recipient is a very slender woman who is very energetic. That way, the skirt will swing around her hips as she races around the dining room at top speed. The colors and trim suit her energetic, bubbly personality. The second apron pictured above is actually the first one I made. 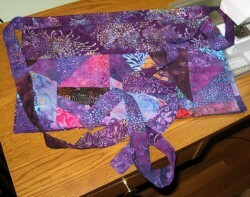 The vibrantly colored batiks that make up the triangular skirt of the apron that I think of as the “boho gypsy hippie-queen apron” were bought as a packet of pre-cut squares called “charm squares” in the fascinating cultural subset of quilters and quilting stores. These time-saving pre-cut fabrics can be combined in a variety of projects, and are a good way to put a quick apron together. Once again, I made this apron without a pattern, and lined it completely with the black fabric that I used for the waistband, ties and pocket. The third apron is one I made from an old skirt that while it was now too big to wear, I didn’t have the heart to get rid of. 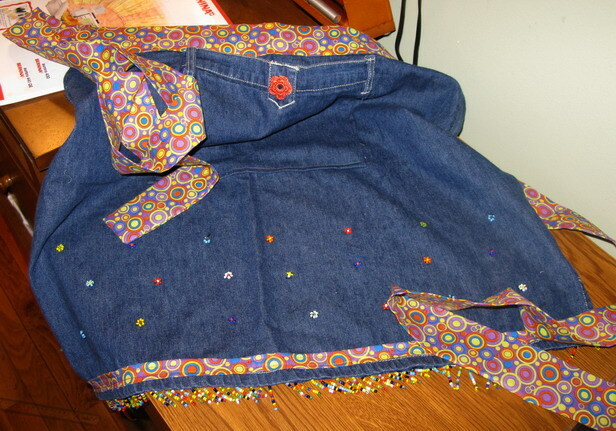 The beaded fringe and little bead flowers are part of the original skirt, but the center pocket I made out of the center back waistband and panel of the skirt using the existing belt loops as a design element. The little orange crocheted applique on the pocket was made in India and has a round mirror in the center–I picked up packets of these on sale at Walmart, if you can believe it.The fabric I used for the new waistband and trim at the hem I picked up without knowing what I was going to use it for–I just knew it would look cool somewhere. 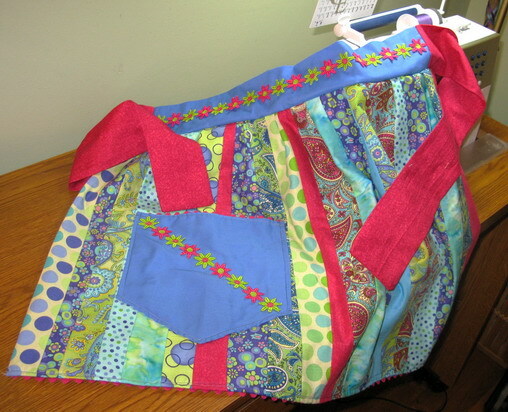 It fit the colors and themes of this project so perfectly, that it looks like it was an apron and not a recycled skirt all along. The fabric for this long “bistro-length”, flat (not pleated or gathered) apron is another set of pre-cuts I bought a year or so ago, with no idea at all what I was going to do with it. This packet was a set of what quilters call “fat quarters”–which are quarter-yards cut from half-yard pieces across the width of the fabric, not the length, so that larger, more usable pieces are made than you get if you just cut a quarter yard from the length of a bolt. (Fabric is wrapped up in bolts for display in fabric stores, and usually, it is measured out directly from the bolt. A quarter-yard cut from the bolt is a piece eight inches by the width of the fabric, which is usually forty four inches. In contrast, a fat quarter measures eighteen inches by twenty-two–a much more useful piece of material for quilting–and apron-making. Anyway, I saw those really pretty fabrics and had to have them, though I had no clue what to do with them. Later, after I figured out I was going to make an apron for one of our belly-dancers with it, I bought that pretty brown print to be the main body of the apron, and was really pleased by how it came out. I am making a similar apron for myself, probably after the holidays, using the same kind of design, but in different colors with reproduction vintage fabrics. I bought the fabrics for this apron specifically to use for an apron for this one specific person. 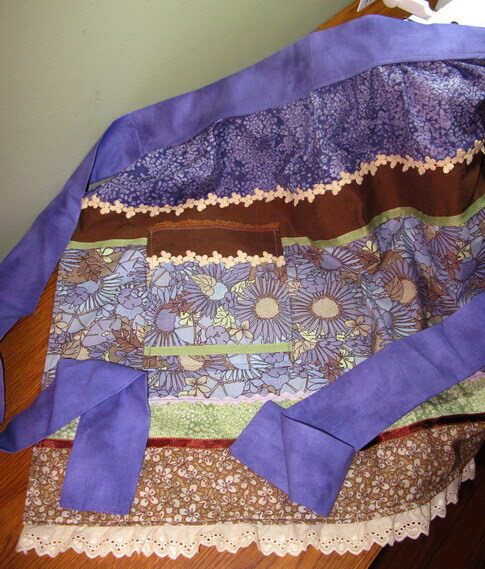 I had a vision in my head of exactly what I wanted it to look like, and I found a bunch of fat quarters bundled together that were perfect, though I added the salt-dyed green and violet blue and the variegated lavender fabric from my own stash. This apron, which is inspired by a pattern I have had for years, is one of only two which are not lined. 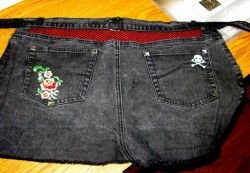 (The other is the one recycled from an old skirt, pictured above.) I didn’t line this one, because I wanted it to have a lighter, more airy feel, so I ended up finishing all of the seams with zigzag stitches to keep them from raveling in the wash. This one I just finished last night, and I patterned it off of a typical short server apron that has three pockets that span most of the front of the apron. In this version, the crazyquilted panel is the pocket–I made it by making the panel first, then cutting it to the proper size and shape and lining it with black hand-dyed fabric–the very same fabric I used for the back lining of the apron. The front skirt of the apron, and the waistband are made from a batik in the pattern of Asian chrysanthemums that I had bought for Zak’s crazyquilted Buddha wallhanging I made for him earlier this year, but it turned out not to fit the theme. I am glad that it found a home in this project, which is for someone who always wears deep, rich colors, and who always looks elegant. I made it from an old pair of my jeans which had holes and which were quite too large for me (I’ve lost a lot of weight over the past few months, and am still losing), which I took apart and re-tooled. The fishnet panel where the back yoke would be is real fishnet from an old pair of my fishnet pantyhose that were too stretched out that I stitched to a backing of red fabric bonded with fusible web interfacing to a piece of the black denim. This panel makes a deep, wide pocket in the apron, so it has that huge pocket, plus the existing two back patch pockets. It can hold lots of goodies, including lots of tips! The rest of the decorations I added using iron-on appliques. I don’t have an embroidery machine. This one is for a sweet lady who does dishes with us on the weekends. I did use a pattern for this apron, though I have to say that if I wrote recipes the way a lot of people write instructions for their patterns, everyone would hate my blog! 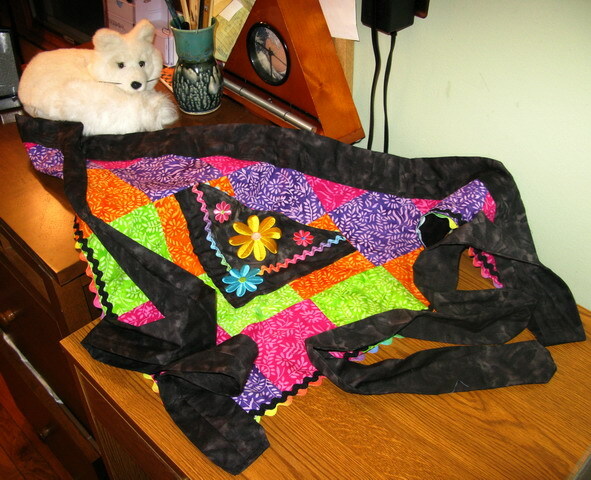 Morganna and I picked out two cheerful reproduction 1930’s prints for this apron, and I made rosettes, called yoyo’s, which were popular in quiltmaking back then, to trim the folded over bits on the bib and the pocket. Then I stacked a white flower-shaped button with a red and blue sparkling glass button to trim the center of the fabric rosettes. The result is very cheery and pretty, which describes out dish-washing friend perfectly. This last apron is so beloved by Kat that every time she sees it, she insists upon wearing it, so I have to tuck, tie and fold it to fit her, but she loves it. So, I am making a version for her to give her for the holiday. I’ll post a picture of it, when it it is done. So, here they are–my first crop of aprons. I am very proud of them–and I am not sure what to do after I am done gifting everyone I know with an apron. Zak says I should start an Etsy store and sell them from this website–I’ll think about that. It might be fun. Very cool. I never remember to wear the aprons that I have, so I haven’t gotten into making any either. But I’ve always thought they could be fun to customize, and you’ve assured me that’s true. Barbara- you are an inspiration. What gifts you have to share with your family and with the blogging world. I read your blog regularly but I rarely comment. I just had to say thank you for all the wonderful posts given so generously about your cooking and life in general. Oh my. They are so nifty! It’s a real bummer I’m not your real-life friend. I WANT ONE!!! You should be proud of all these creations! They are stunning, and you could easily sell these on etsy. I look at aprons there occasionally, and every time, they just look so… patterned and blah. Yours have character, and I would pay a pretty penny for one. You are so gifted— it’s dazzling! i remember when i was growing up, women wore aprons…period. and those for cleaning house, and of course there were the really nice ones for entertaining. i love these that you’ve made. they’re a perfect gift. especially now that folks are actually starting to rethink their values…saving one’s clothes from stains…means saving money. Ooh. Dibs on the denim skirt one! OH….these aprons are so delightful. Love the colors and the way you trimmed them. How proud each person will be when they wear them. You REALLY should! Spending over 50 hours a week at the cooking school I run and wearing the stock black apron gets tired really fast. I would be your first customer I assure you! how very cool, barbara! i won’t tell. and i had SO much fun figuring out who each one is for! Ach! I do read your blog, but obviously not often enough. I didn’t know about the aprons until I spotted Keri’s in the apron basket last night. I ran up front with it, waved it around and demanded, “Where did Keri get THIS?” They are all beautiful! Etsy seems very easy and lucrative for some people. If you have the time, I think you should go for it! Happy Solstice, Merry Christmas and all that jazz, see you soon! Great aprons. They’re so cute and colorful. Laura, there is an apron for you, too–I just don’t know if Morganna brought it to Salaam for you or not. It is probably there for you somewhere. Sweet! I’ll look for it when I go to pick up my paycheck tomorrow! Thanks, Barbara!